The drone, whose goal is to make Internet accessible to the whole world, is protected by a Kopron warehouse. Very few ideas and magnificent projects transform into reality. Brilliance, hard work and sacrifice are just a few of the vital ingredients that allow for something Extraordinary to be made that, up until a short time ago, could only be imagined. This is the case of the latest project that Facebook and its founder, the amazing Mark Zuckerberg, have decided to illustrate to the planet: Aquila, a drone that flies with a revolutionary objective, confronting the Digital Divide and allowing the whole World to connect to Internet, without any geographic, cultural or income related limits. 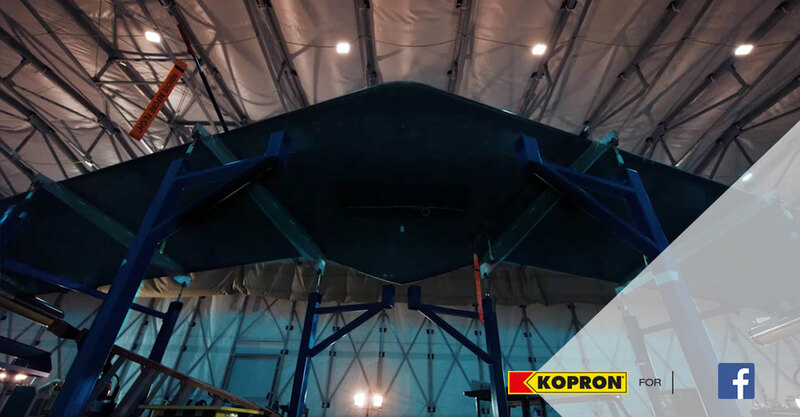 Kopron wanted to be a part of this with its core product, the mobile warehouse, by contributing to this dream and providing the very best in order to protect the making of this creation. Through its authorised American dealer, ACE Structures, the Kopron team has installed a sliding and retractable 600 sqm mobile warehouse, with front and back curtains and a pedestrian door in Yuma, Arizona, where the Facebook team met up for the first test on Aquila after years of hard work. The structure of the Kopron mobile warehouse is made from hot galvanised steel tubes, while the roof is made from a sturdy polyester tarpaulin covered on both sides with PVC with a self-extinguishing treatment, class II. The dimensions of the Kopron retractable and sliding warehouse have been made to measure to hold work on site of this futuristic drone: 12x50x5m, with the possibility of sliding on tracks on IPE beams. The retractable and sliding warehouse has been specifically laid on 30cm high tracks in order to avoid dust and sand of the desert from obstructing the retraction and sliding mechanism of the warehouse. 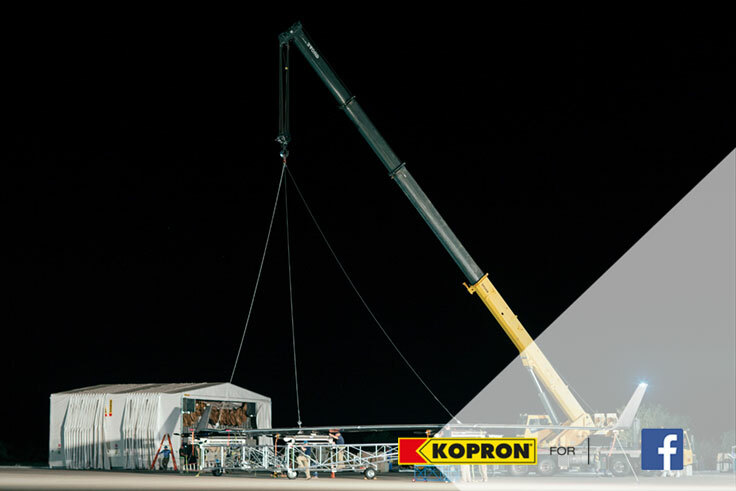 Franco Lombardi, Export manager of Kopron enthusiastically states “We have succeeded in creating a mobile open-sky mobile warehouse in the Desert, finding an intelligent solution for a project that is history”. 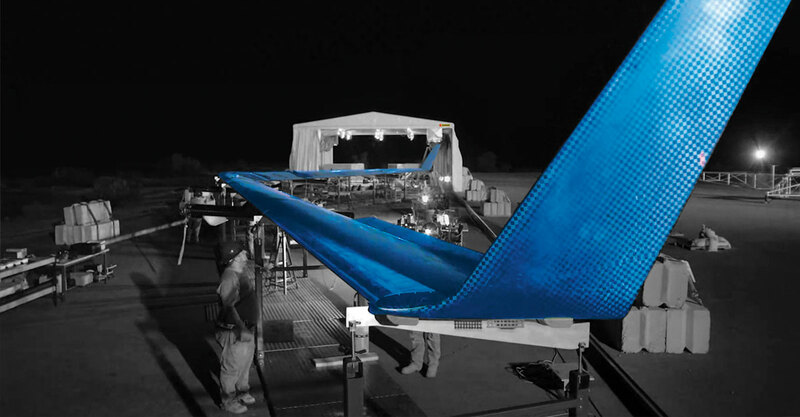 Aquila is powered by solar energy built from carbon fibre, with a wing opening similar to that of a Boeing 737 and designed to ‘weigh’ only 900 pounds (approximately 400 kg). After having been designed with attention to even the smallest of details, the Aquila drone has passed the first functional test with flying colours by flying for approximately 90 minutes and consuming only 2,000 Watts of energy, comparable to the power of 3 hairdryers. The result to be achieved in the near future is to fly the drone for at least 90 consecutive days, allowing the laser communication system fitted on it to provide data 10 times quicker than the standard. The laser is so accurate that it can aim at a coin from a distance of 10 miles. Taking part in important projects has always been the pride of Kopron, who on this occasion did not pull out. Facebook tries to innovate and change the World through advanced technologies and brilliant minds, Kopron does the same thing.